Kent may no longer boast a working Royal Naval dockyard but the salt traditions still runs deep through the veins of the County. There will be many, including the families and friends of my own constituents serving on HMS Bulwark, who will have watched with the mixed emotions of sadness and pride the television reports of the evacuation of the British from Lebanon. Sadness because their boys and girls had already been at sea for more than half a year and were on their way home when the call came and they were turned back on their errand of mercy. Pride, because those same boys and girls were doing what they were trained to do so well in the interests of our country and in the service of its citizens. For most, our sailors and Royal Marines are visible on Navy Days and during goodwill visits to the seaside towns and ports with which they have formed associations. For the rest, the Senior Service is out at sea, out of sight and out of mind. To see the terrorised and traumatised families, refugees and innocent victims from a vicious and unnecessary war, enjoying the relative comfort and certain safety of the wardroom, and to know that sleepless sailors had turned over their cabins and their bunks to those in greater need, once again underscored the point that, when needed, our navy is still there. Just. I flew, in May, to join HMS Bulwark off the coast of Oman. Following months on patrol in the Gulf in support of our troops in Iraq she was engaged in the interdiction of small craft plying between the coast of Pakistan and East Africa and carrying contraband fuel, drugs and, more sinisterly, likely "AQ" terrorists. From Muscat she entered the Red Sea before travelling through Suez and into the Mediterranean on her way home. She was due to cross the Straits of Gibraltar when she was ordered back to Lebanon for the evacuation. 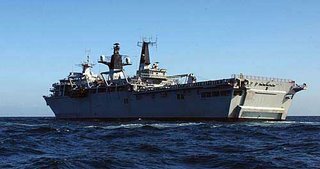 HMS Bulwark is one of our newest capital ships, launched in November 2001. An LPD (Landing Platform Dock), she has a crew of about 300 and an additional complement of 83 Royal Marine Commandos. She also carries a further 300 Marines together with Landing Craft, Tanks and helicopters. The men and women on board are amongst the most highly-trained and professional that it has been my privilege to meet and the ship punches way above her "general capability" fighting weight. There is a dark side, also. HMS Bulwark was conceived during cold war days and designed for operations in Arctic waters. For the past many months her engineers have been battling to keep her cool and working in an intense heat with which her systems were never intended to cope. That they have done so successfully is I tribute to their skill rather than that of military planners. HMS Bulwark will, shortly, return to her home port and, I trust, a heroes welcome. Her crew will take a much needed break and the ship will go into re-fit. It would be good to think that a grateful nation will now make sure that she will, belatedly, be given the additional capabilities that she, and those who serve in her, need and so richly deserve. Her Captain, Clive Johnstone, said to me this week, "You can be very proud of your ship". I am, and I want better for her. And thanks to whose Party does Kent no longer have a working Naval Dockyard? Oh, yes, that would be Gale's Tories. And thanks to whose Party does Britain no longer have a working Armed Forces? Oh yes, that would be Blair's Socialists. The British Armed Forces work so hard, putting their lives at risk, and make no complaints. The least this Government could do is ensure those Blair sends are equipped properly. It cant even do that. You seem to forget, Mr Maskell, that members of the Armed Forces choose to be there and are (well) paid for what they do. They know the risks before they join up, and have been far from silent about equipment failings. They are not the conscripts of years past. I always find Gale's cuddling up to them and the Police, set alongside his sarcastic and disparaging references to others in public service - he refers to "bean counters" here, and he has referred to "pen-pushers" elsewhere - quite sickening. I wonder why he never joined up rather than become a pirate broadcaster? And no, I don't think his much mentioned, but seldom demonstrated, role as a "British Transport 'copper'" counts for anything here.